This salad is the perfect way to usher in the spring season. And while asparagus and eggs might make for a great breakfast combo, they’re just as good for lunch as well. This recipe is also incredibly easy to double or multiply if you need to make it as a side salad to accompany the family dinner. Interestingly, this salad contains neither lettuce nor tomato. Instead, you simply need to combine an egg, bacon, and asparagus, together with vinegar, olive oil, and mustard for a yummy yet tangy combination. 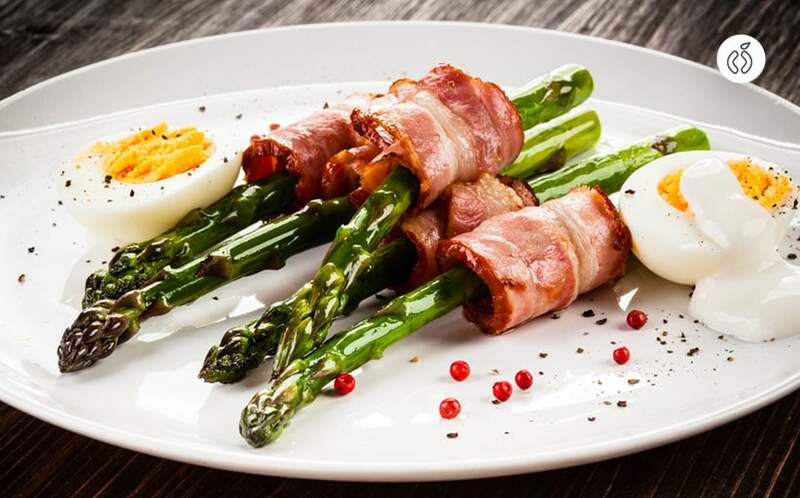 The egg makes for great protein, while the asparagus serves as your vegetable and the bacon the meat. This is another dish that could benefit from a side of fruit, since that’s the only Paleo ingredient that’s missing, so maybe toss in some orange or strawberry slices for good measure. Or you can always go with the easy option of just adding a fruit cup in as a side portion. 1. Bring a pot of water to a boil. 2. Add the asparagus and cook two to three minutes until tender yet firm. 3. Drain and run under cold water to stop it from cooking further. Set aside. 4. In a small bowl mix the Dijon, oil, vinegar and a pinch of salt and pepper. 5. Arrange the asparagus on a plate, top with egg and bacon, and drizzle with the vinaigrette. Enjoy! Jon is a certified nutritionist and wants to create a site where he can help readers live a healthy and nutritious life. He believes human beings deserve to live a long and healthy life by eating properly and taking care of their body and spirit. "Paleo for Beginners: Starting Guide"
Hi, I’m Jon. My life passions are nutrition, exercise and well-being. I grew up in a poor family being quite often malnourished, so after getting my Fitness Nutrition Certification, I wanted to create a site where I could help readers live a healthy and nutritious life. I believe human beings deserve to live a long and healthy life by eating properly and taking care of their body and spirit. Is Paleo Diet Appropriate for Bodybuilding? Is Paleo Diet Appropriate For Athletes Based on Facts?